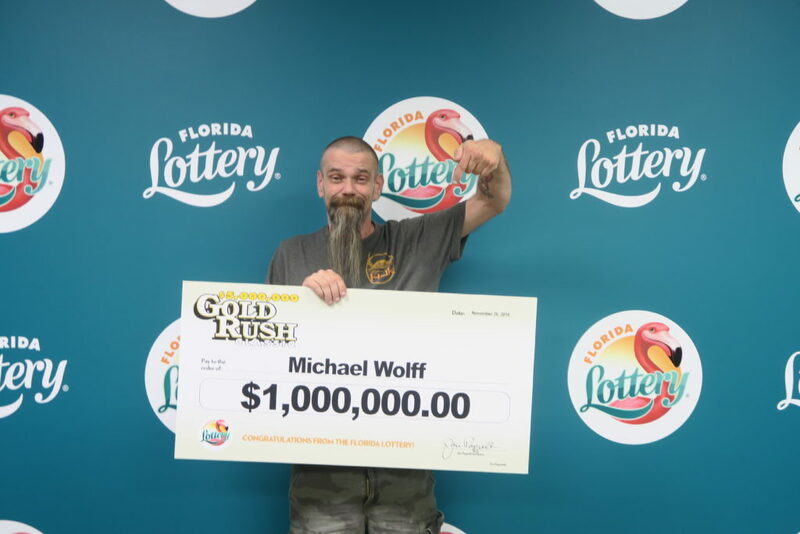 The Florida Lottery announces that Michael Wolff, 48, of Orlando, claimed a $1 million prize in the $5,000,000 GOLD RUSH CLASSIC Scratch-Off game at Florida Lottery Headquarters in Tallahassee. He chose to receive his prize in a one-time, lump-sum payment of $710,000.00. Wolff purchased his winning ticket from Star Food Mart, located at 3011 Goldenrod Road North in Winter Park. The retailer will receive a $2,000 bonus commission for selling the winning Scratch-Off ticket. Michael Wolff poses with his oversized check after claiming a $1 million prize in the Florida Lottery’s $5,000,000 GOLD RUSH CLASSIC Scratch-Off game. The $20 game, $5,000,000 GOLD RUSH CLASSIC, launched in October and features over $900 million in prizes, including six top prizes of $5 million and 30 prizes of $1 million! Overall odds of winning are one-in-2.99.